Have you ever dreamt of racing with fastest cars from renowned manufacturers and feel the real thrilling experience of fast races? 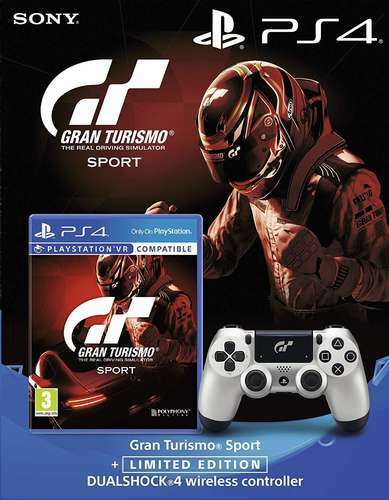 If not, then that is what a copy of Grans Turismo Sports + limited edition DualShock 4 wireless controller has to offer. GTSport is a new real driving simulator sport that has just raced right into you PlayStation 4. It brings with it an exciting and thrilling racing adventure and an experience of the world’s fastest cars.Gran Turismo sport + limited edition dualshock 4 wireless controller is every serious gamer should be looking for now! • Highly sensitive and refined trigger buttons and dual analogue sticks. They will give you an extremely high sense of game control. • A built-in touchpad that offers greater precision while in action and multiple ways of game interactions. • An integrated light bar that displays an array of colours to depict different actions. It also shows multiple colours which differentiate the various players. • Inbuilt controller speakers help you get extra sound effects straight from it. • A stereo headset jack to fit in your headphones adding more audio options. • A share button that offers you an opportunity to capture and share your most excellent stunts. Besides you can Livestream the ongoing game without any interruptions. Gran Turismo sports + limited edition DualShock 4 wireless controller offers thrilling moments and racing experience that keeps your pulse racing.